The concept and implementation of Single Stream Waste Processing is growing rapidly and with it is the need for Single Stream Compactors and other Waste Equipment for handling the collection and storage of mixed materials. 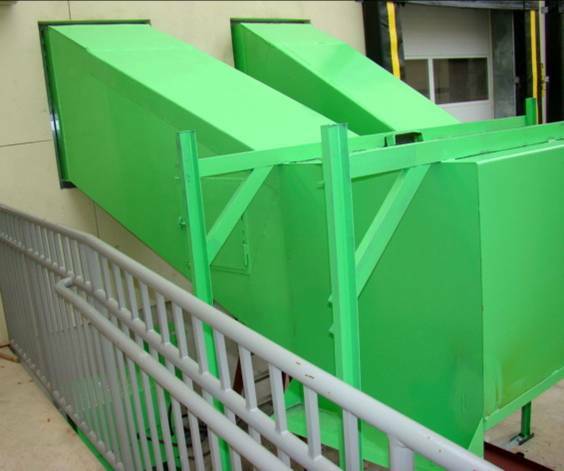 Single Stream Waste Processing allows commercial generators the flexibility of combining plastics, paper, aluminum and other common materials into one container for the purposes of recycling while placing the Landfill type waste into another (such as wet waste and food waste profiles). Thus, there is a new breed of dual compartment containers emerging that iare properly partitioned and constructed to serve this purpose. 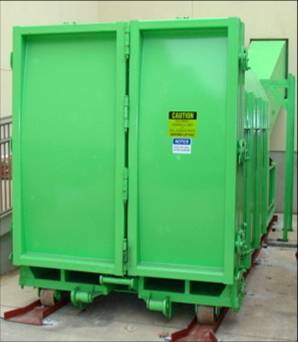 Each compartment has its own rear door for unloading the waste materials. For example, with a typical 34 yard Self Container Compactor 19 cubic yards is allocated for Recycling and 15 yards for Landfill Waste. Oftentimes the Single Stream Compactors are implemented with a 'Through the Wall Configuration' with twin chute feeds. Clear Top Opening (L" x W") SSC-340T-CTO 41" x 58"
Ram Face Dimensions (W" x H") SSC-340T-RFD 60" x 29"
Compaction Chamber Length SSC-340T-CCL 70.5"
Overall Dimensions (L x W x H - Rounded) SSC-340T-DMN 23'-9" x 8'-3" x 8'-6"
Twin Cylinder Bore / Rod Diameter SSC-340T-CBR Twin 4" x 2"
SSC-340T-14 - Thru-the-Wall Door and Sleeve Assembly 40"